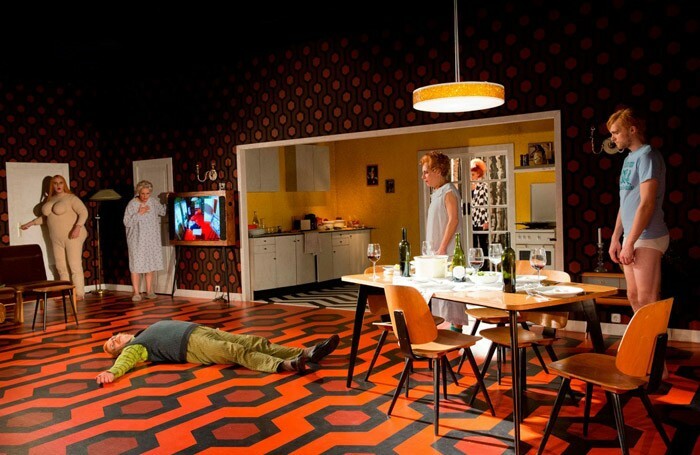 Scene from Tyrannis at Berliner Festspiele. Dystopian futures, zombiefied families and a sea-burial in the Aegean ocean – we’re one week into Theatertreffen 2016 and despite the gorgeous, springtime weather, the mood is decidedly apocalyptic. Now in its 52nd year, Theatertreffen brings ten of the most remarkable German-language productions to Berlin for an annual festival of performance, political debate and cultural discussion. The unrest unfolding throughout Europe and the crises beyond its borders have seeped into the fabric of this year’s selection. The displacement of refugees, the reemergence of right wing populism and the spectre of terrorist violence permeate these on-stage worlds. Visions of upheaval and images of catastrophe recur; the performances swirl with a combustible energy; the threat of implosion simmers beneath the surface of each live encounter. These discourses clash in Karin Beier’s shape-shifting polemic, Schiff Der Traume (Schauspielhaus, Hamburg). When an orchestra set sail into the Aegean for the sea-burial of their conductor, their ship rescues four African refugees stranded at sea. Beier’s production is a shifting symphony of conflicting forms and registers. It threatens to spiral out of control, hurtling from the somber, funereal tones of the orchestra’s rehearsal to the bombastic and abrasive intervention of the black performers. Beier and her ensemble have refashioned Federico Fellini’s 1983 film into frenetic collision of art, music and politics for a stingingly satirical anatomization of cultural identity and integration. of David Lynch’s Twin Peaks with its mixture of dark hues and kitsch household trappings. But it’s the arrival of a stranger and the ensuing breakdown of the family cycle that awakens their repressed, violent impulses and culminates in a terrible act of expulsion. Finally, Stefan Pucher’s Ein Volksfeind (Shauspielhaus, Zurich) envisages Ibsen’s spa-town as a futurist utopia on the verge of ecological catastrophe; a world in which democracy has been digitized, the public crowdsource policies online and the citizens live free and healthy lives. But when political choices can be made en masse at the click of a button, what happens to individual accountability?Barbara Ehne’s design combines the smooth, antiseptic surfaces of a health resort with a large-scale model village, while Ute Shall’s roaming video design projects the performers in close-up. ways of engaging with the world.